Skylar Houston, center, Aristocrat Angus, explaining about his operation. Roy Wardell, 2012 CAA Pioneer Breeder and Mourine Weaver, CAA President. 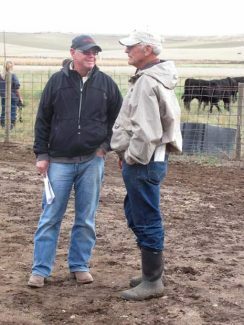 CAA Treasurer Mark Nieslanik visiting with Keith Russell, 2010 CAA Pioneer Breeder. Merlin Frank and Holly and Shelley Heckendorf admiring an outstanding bull calf at Keith Russellâs, KMR Angus. Enjoying great cattle and a welcome rain at Roy Wardellâs. 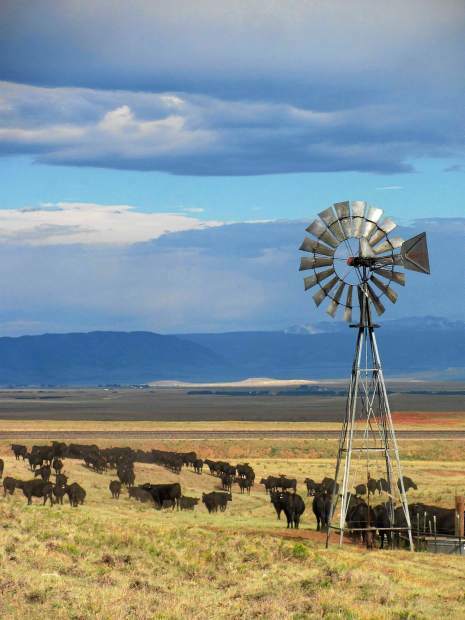 Colorado Angus breeders and beef enthusiasts alike had a great opportunity to get together for the Colorado Angus Association's (CAA) Banquet and Annual Meeting and Ranch tour, held October 12-13. The festivities started at 5:00 p.m. on Friday, the 12th at the Larimer County Fairgrounds in the Morehouse Hall with a social, followed by a CAB dinner buffet and the Annual meeting. Terry Walter gave the invocation. 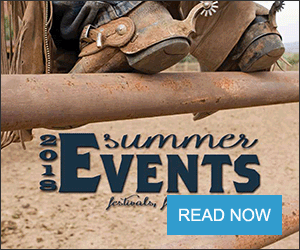 Special guests were Evan Slack from the Evan Slack Network, Matt Printz from the American Angus Association, Kathi Creamer, 2012 candidate for the American Angus Association Board of directors, and Arlene Penner, Colorado Junior Angus Association, Advisor. The buffet was immediately followed by a presentation by the Colorado Junior Angus Association President, Morgan Penner from Lafayette, Colo. Morgan gave a brief overview of the Junior Association and introduced other Junior members that were present: Daniel Clayton, McKayla Clayton, Jessica Harrison, Grace Harrison, Sage Harrison, Holly Heckendorf, Andrew Schafer and Reece Melton. "Fetal Programming" was the topic presented by the Keynote Speaker for the evening, Dr. Rick Funston. He is an Associate Professor at the University Nebraska, currently serving as a Beef Reproductive Physiologist with the West Central Research and Extension Center at North Platte, Neb. His informative program talked about the importance of nutrition during the different stages of a heifer's pregnancy. Dr. Funston answered questions after his presentation. Following Dr. Funston's presentation, the 2012 Annual Meeting was held. Mourine Weaver, Outgoing President, gave her President's Address, outlining her "Journey" as President. Andrew Schafer, 20-year-old Angus breeder from Cortez, Colo., was newly elected to serve on the Board of Directors for a three-year term. Mark Nieslanik and Leland Dale, were both re-elected to serve three-year terms. Each year the CAA presents two prestigious awards, the Pioneer and Promoter. Receiving the Pioneer Award was Roy Wardell of Platteville, Colo. Roy, a long-time Angus breeder, also served as Director of the CAA. Roy's father, Jerry (J.J.) Wardell, was awarded the Pioneer Breeder award 32 years ago in 1980. Walter Angus from Hudson, Colo., received the Promoter Award. Last year at the 2012 National Western Stockshow in Denver, Colo., Walter Angus had the Champion and Reserve Champion pens of Commercial bred heifers at the Bellringer Sale. Colorado Delegates to the American Angus Association Annual meeting in Louisville, Ky., in November were announced and are as follows: Keith Russell, Chair; Michael Ripp, Mark Nieslanik, Ken Amen, Marsha Holton, Lorna Marshall and Samuel Carter. CAA Vice-President Marsha Holton, on behalf of the Board of Directors, presented Mourine with an engraved Star shaped paper weight, thanking her for her hard work and dedication as President for the last two years. Matt Printz auctioneered off the premiere pages for the upcoming 2013-2014 Colorado Angus Directory, the "Black Book." Rounding out the evening, there was an Angus Producer Panel Discussion which was moderated by Matt Printz. Panelists were Ken Amen of Iliff, Colo., Don Gittleson of Steamboat Springs, Colo., Curt Werner of Merino, Colo., Duane Yearous of Fort Morgan, Colo., and Dr. Rick Funston. The Panel talked about their Operations and different management ideas. Saturday morning, October 13, the CAA hosted the Ranch tour with some of the area's leading seedstock Angus Producers. 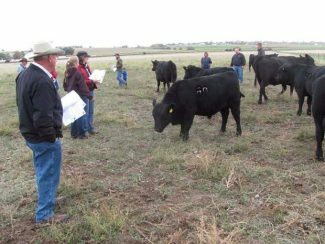 Despite cooler temperatures and scattered rain showers, the tour participants had the opportunity to see outstanding groups of Angus Cattle. A tour participant asked if the tour could be held next summer so that we could get some summer moisture. Last year's September tour held in Steamboat Springs was cool and rainy also. 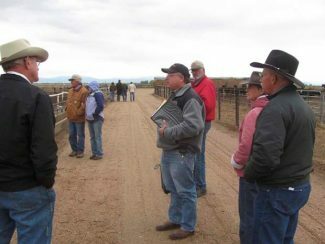 The first stop was Walter Angus in Hudson, Colo. Terry, Becky, Katelyn, Ty and Trevor had a tremendous set of cattle available for viewing. 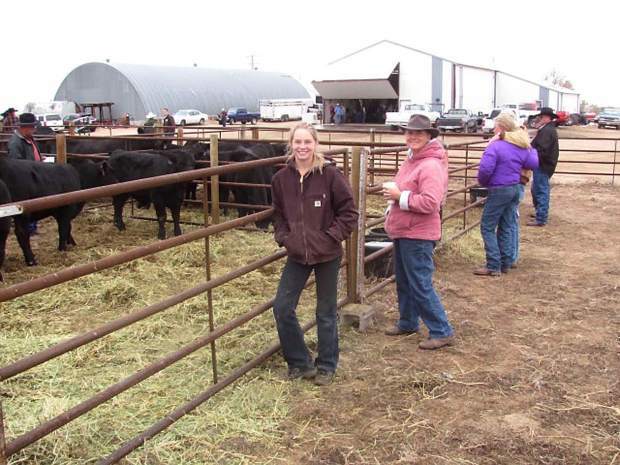 They have had winning pens of commercial heifers for several years at the Bellringer Sale held during the Stock Show. 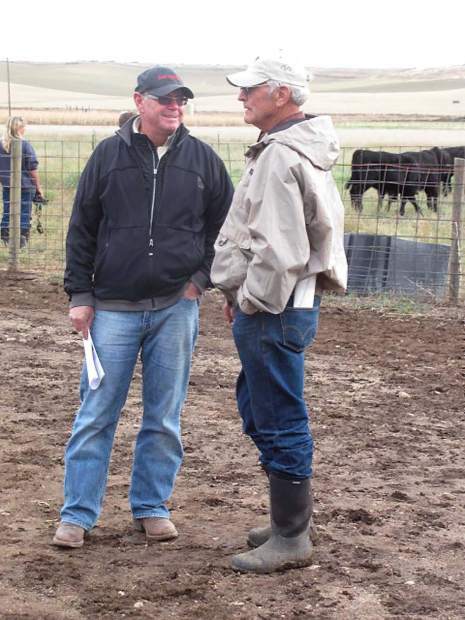 Walter's are committed to raising functional, forage developed cattle. Walter Angus also had graciously set up pens for other CAA members to display cattle. Brad Johnson, Running J Angus Ranch, as well as Junior members Holly Heckendorf and Morgan Penner took the opportunity to show and talk about their cattle. The second stop on the tour was at Beaman X6 Ranch. 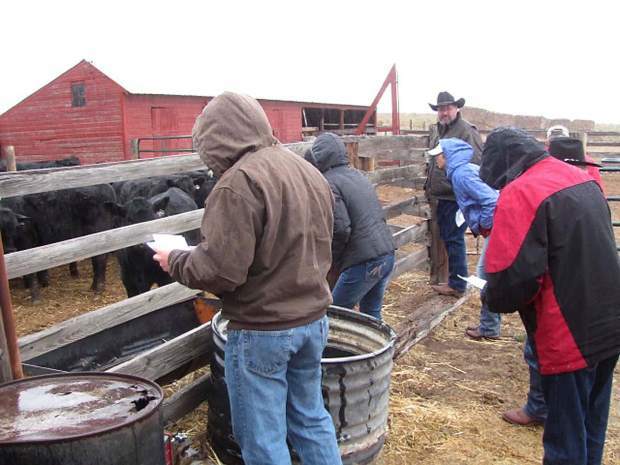 Chuck, Gloria, Scott and Bryant had several pens with tremendous sets of heifers and bulls. Seven-year-old Grandson, Bryant, told people, "I am very proud to be part of this operation." He is a very enthused future Angus breeder. They will be consigning an outstanding Herd Sire Prospect to the 2013 NWSS Angus Bull sale. The final stop before lunch was at Roy Wardell's. 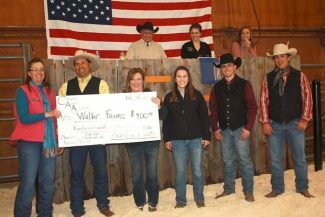 Roy was awarded the CAA Pioneer Breeder for 2012, the night before at the Banquet. Juan, Yariela, Lesly, Ashly, and Audry Loya are partners with Roy in the operation and had put together an exceptional set of their angus cattle for the tour. 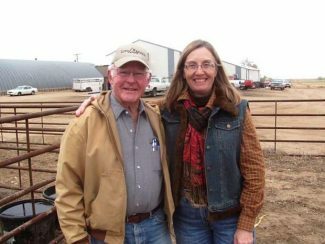 High Plains Cattle Supply owners, Robert and Ashley Farnum, graciously hosted a lunch facility at their retail store off of Highway 85 just north of Platteville, Colo. By the time everyone arrived for lunch, there was a heavy rain. The hosts and their employees grilled the delicious Certified Angus Beef hamburgers donated by Lombardi Brothers of Denver, Colo.
Aristocrat Angus of Platteville was the first tour stop after lunch. Skylar Houston gave a brief overview of the operation. Aristocrat has been supplying quality Angus seedstock for over 50 years. They specialize in high quality replacement females and well-balanced, high performing bulls. 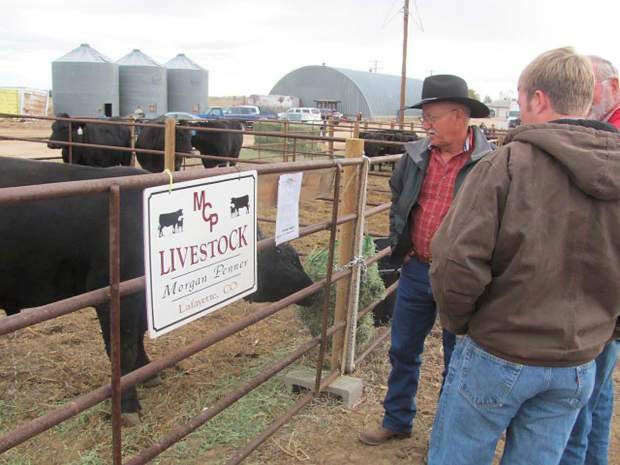 Keith, Lyn and Randy Russell of KMR Angus of Johnstown, Colo., was the final stop on the tour. Keith was the 2010 CAA Pioneer breeder. Russell's had a tremendous set of cattle available for viewing as the last stop on the tour. 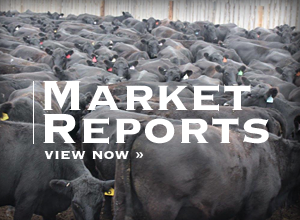 KMR Angus's cow herd is built on Production and Quality and sell PAP tested bulls. Officers serving the CAA for 2012 were Mourine Weaver-President, Marsha Holton-Vice President, Jeff Meyers-Secretary, Mark Nieslanik- Treasurer, Leland Dale, Tari Hoagland, Emmett Jordan and Bill McKee.